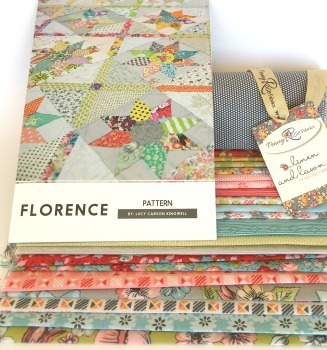 This kit includes the Florence pattern by Lucy Carson Kingwell and a hand cut fat eighth pack of the 21 prints in the beautifully soft Linen & Lawn fabric range from Penny Rose. These lovelies are not the original fabrics used for the pattern cover but they are similar fabulous colours and mix of geometric and floral prints. Please note this pack contains 2.4m(approx 2.5 yds) of fabric prints required for the flowers and crosses in the quilt top pattern, but you will need to add a variety of fat eighths/sixteenths/scraps in low volume/neutral fabrics for your backgrounds for a total of 3.5m (approx 4 yds). This lovely pattern is written for hand piecing, although the cross blocks may be machine pieced if desired. The finished quilt measures 142cm square (56") with a finished block size of 8".